The powertrain of the new 911 GT3 is composed of a 3.8-liter boxer engine yielding 475 hp (350 kW) at 8.250 rpm, a Porsche dual-clutch transmission (PDK) and a high-traction rear-wheel drive. The six-cylinder engine is based on the same engine as the 911 Carrera S, although they share only few common parts. 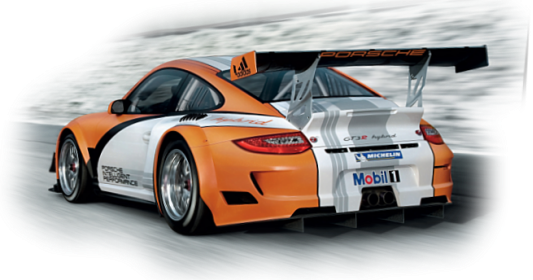 All other components, particularly the crankshaft and valve gear, were specially adapted or designed for the GT3. For instance, Porsche designed titanium connecting rods and forged pistons. The basic modifications set the stage for an extremely high-speed engine that reaches up to 9000 rpm. The Porsche dual-clutch transmission was also specially developed; the characteristics are directly based on a sequential gearbox from motor racing, thereby providing further performance and dynamics advantages to the driver. For the first time, Porsche is using active rear wheel steering in order to achieve even higher precision and lateral dynamics. Depending on the speed, it steers in the same or opposite direction of the front wheels, improving stability and agility. Other new modules improving driving dynamics are the electronically controlled, fully variable rear differential lock, and the dynamic engine mounts. The newly developed all-aluminium chassis can still be adjusted by height, toe and camber. Contact with the road is made by the new 20-inch forged alloy wheels with central locking. 911 Carrera in hybrid steel-aluminium construction, however, it comes with independent front and rear parts. In addition, the 911 GT3 is 44 millimetres wider than a 911 Carrera S in the area of the rear axle. Another clear recognition feature is again the large, fixed rear wing. This makes a decisive contribution to the exemplary aerodynamics of the new 911 GT3, which combines low air resistance with even more power. Last edited by FTS; 03-10-2013 at 04:46 PM. The launch event during the NYIAS was well organized for the PCA members in cooperation between Porsche AG, NA and PCA, over 100 members enjoyed the personal attention and the chance to get up close and personal with the new car. The posture and stance of the 991 GT3 best experienced in person as it is the case almost always. The way it looks to hug the ground is very well balance with increased width both front and rear, and the longer length and wheel base. But there is more to its posture than just the increased dimensions of the car; I am not certain, but I would believe if the ratios of the door height to side window height has been changed in a fashion that the cockpit of the car looks lower overall. This combined with what appears to be a decrease windshield angle and increase wheel arche arcs, just make this car work for me even in stand still. Of course, I do not know if any of those ratios or angle have actually been changed, but it appears that way. And NO "Sport Bucket Seats" available in North America! The 20" wheels really don't look out of place. This car was equipped with Dunlop tires to my surprise, but Porsche NA could not confirm the tire brand or model choice for US until later in summer. what does the "race track" button do? I missed that button frankly, I am not sure Larry. I was hoping they'd say that, but they did not know. When they know the answer, they have been forthcoming, so I am pretty sure they did not know the answer. is that a front axle life button I see ... I thought that was not yet available? I thought so too, but I think it may become available in Euro version first. This is the Geneva Show car, so it is Euro spec. What you see in this car may or may not be applicable to the US version, for example the seats are certainly not. euro sports buckets with dev stitching look great!